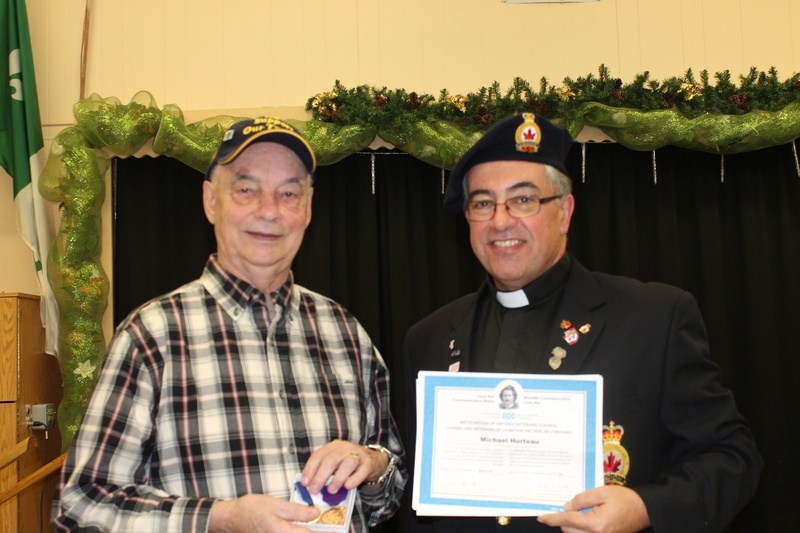 On Saturday, December 10, 2014, at the MNO Sudbury Métis Council’s annual general meeting, MNO Veteran Michael Hurteau was presented with the Louis Riel medal and accompanying certificate, along with the Batoche medal. Veteran Steve Callaghan (secretary of the MNO Sudbury Métis Council) was on hand to do the presentation. Many thanks go out to all MNO citizens that helped in organizing this presentation. Thank you for supporting our Veterans. 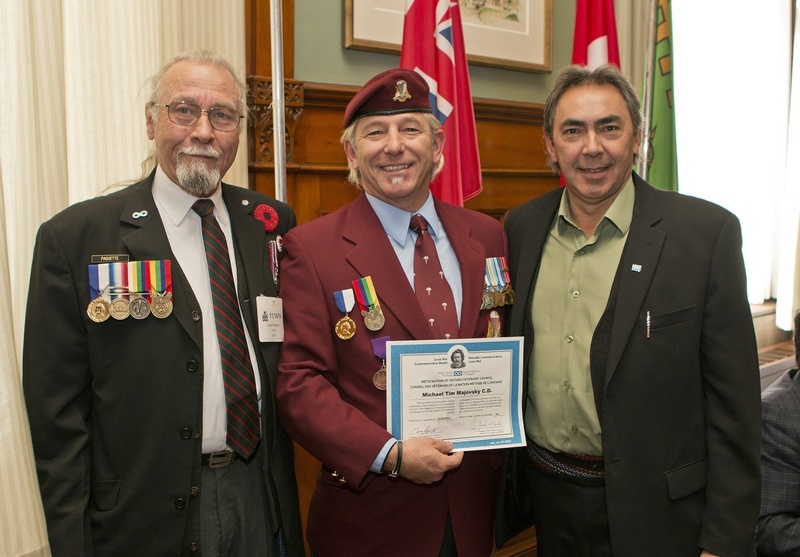 On Friday, November 14th, 2014 at Louis Riel Day at Queen’s Park in Toronto, MNO Veteran Tim Majovsky, C.D., was presented with the Louis Riel medal and accompanying certificate by Métis Nation of Ontario President Gary Lipinski. The Batoche medal was presented by Joseph Paquette, MNOVC President. 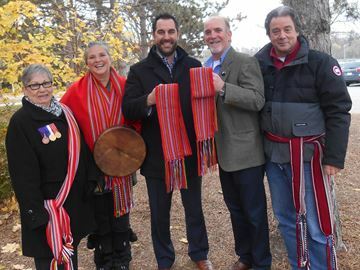 The MNO Veterans’ Council representatives were invited to participate in the MNO Credit River Métis Council celebration of Louis Riel Day on November 16th, 2014. Both the president and senator of the MNO Veterans attended. The MNO Credit River Council donated the proceeds of the 50/50 draw to the MNO Veterans’ Council. The occasion provided the opportunity to show-case our veterans and promotes the MNO Veterans’ Council. Many thanks go out to the MNO Credit River Council and their citizens. 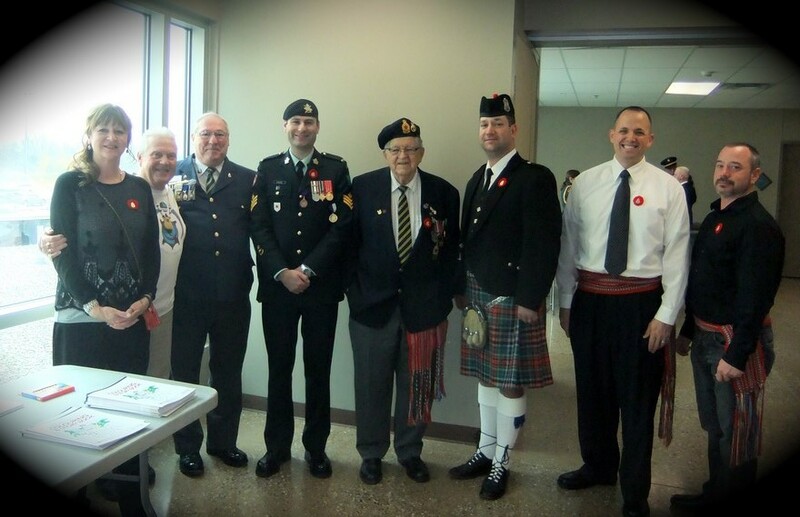 The MNO Veterans Council held a regular scheduled meeting on November 1st, 2014 in Ajax. 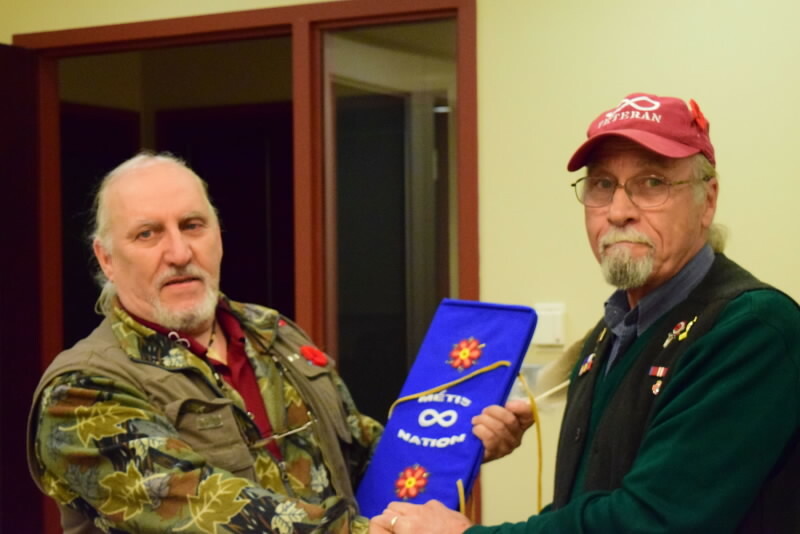 During the meeting, the chair of the MNO Veterans Council, Veteran Guy Mandeville, C.D., was awarded an Eagle Feather for his continuous local youth community involvement in promoting Métis history, culture and especially education. Guy is very active in local schools, Scouts Canada and other various local organizations. On Sunday November 16th, many member of the Windsor and local Métis communities attended the WFCU Centre in Windsor, the Windsor Essex Kent Métis Council along with the Windsor MNO Health Branch celebrated Louis Riel Day and Remembrance Day. A Military Honour Guard and Piper started the event followed by Women's Rep Donna Grayer and an opening prayer in the Ojibway language. Sergeant Adam Girard served two tours in Afghanistan and was honoured with the Louis Riel Medal, Louis Riel Certificate and the Batoche Medal. We then had a great lunch and community meeting. We made blankets for the local women's homeless shelters to remember the tragedies and violence not only against Aboriginal women but all women. Metis lunch and closing prayers were performed by Metis Youth Sienna Rochon and Vice President Wilfred Rochon (also a WWII veteran). Great thanks goes out the Windsor MNO Health staff (October, Jenna, Audrey and others) who helped make this event possible. Parliament Hill in Ottawa on Thursday, Nov. 6, 2014. 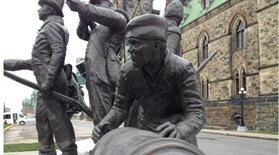 A new monument was unveiled on Parliament Hill Thursday, inspired by the War of 1812 more than 200 years after its last battle on Canadian soil. The monument, designed by Toronto artist Adrienne Alison, is called "Trial through Diversity." 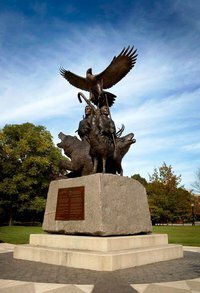 It features seven bronze figures representing the people who fought for Canada during the war. The figures include a Métis fighter, a Canadian militiaman, a member of the British Army and a woman bandaging a fighters’ arm. All of the characters stand in a circle, facing outwards. The figures stand on top of a rough granite base, which is meant to symbolize the "ruggedness" of the land in the 1800s. There are also two granite pieces on either side of the monument shaped like pieces of a boat. These are meant to represent naval warfare during the War of 1812. One of the figures, a Royal Navy sailor pulls a rope attached to the boat’s base. The texture and shape of the base are also meant to remind viewers of the rough cliff on which Parliament stands and the arches of the Parliament buildings. The minister of Canadian heritage and official languages, Shelly Glover, unveiled the new monument Thursday morning to mark the 200th anniversary of the Battle of Malcolm’s Mills. "This new landmark on Parliament Hill will forever remind us of the courage and bravery of those who served and successfully defended their land in the fight for Canada more than 200 years ago," the minister said in a press release. By lunchtime Thursday, the monument had drawn tourists and Ottawans on their lunch breaks to the Hill. The monument "makes history come alive," Ottawa-based technical writer Don Douglas said. "It’s really well put together." Janny Salis, a tourist from the Netherlands, said the statue is part of Canada’s internationally recognized war history. In the Netherlands, she said, Canada is widely known for its role in the Second World War. "It made a big impression," Salis said of the monument. "We must every year remember the wars." The War of 1812 began in June 1812, when Canada was not yet its own independent country. During that time, American forces invaded what is now Canada in their fight against Great Britain. Militia from Upper and Lower Canada joined Metis, Aboriginal, and British forces to fight back the invasion. The war officially ended when the Treaty of Ghent was ratified in 1815. The government’s commemorative website for the War of 1812 says Canada would not exist without the victories in the war. But the government was criticized in 2012 for dedicating $28 million for the campaign to commemorate the war featuring festivals, re-enactments of historic battles, and commemorative coins and stamps. Native studies co-ordinator Nick Bertrand of the Halton District School Board (centre) and Milton District High School Native studies teacher Keith Pearce (second from left) accept traditional Metis sashes from (from left) Lorna Burke (elder/knowledge keeper of the Clear Water Metis), Sharon McBride (Vice Chair of the Metis Nation of Ontario) and David Neville (Councillor of the Credit River Metis Council). In honour of Louis Riel Day (November 16), Milton District High School held a special Metis Nation flag raising ceremony Thursday morning. Students have been learning about Riel — the defender of the Metis people — as part of their recently-expanded Native studies classes. On hand for the ceremony were Vice Chair of the Metis Nation of Ontario Sharon McBride and David Neville, Councillor of the Credit River Metis Council, as well as Lorna Burke, an elder/knowledge keeper of the Clear Water Metis and a decorated veteran. Halton MPP Indira Naidoo-Harris and school board dignitaries were all present for the ceremony, which including a Metis prayer, singing and a presentation by the students. Native studies teacher Keith Pearce and program co-ordinator Nick Bertrand were presented with traditional Metis sash, which represented the mixing of races. Every year on November 11, Métis from across the homeland participate in Remembrance Day Ceremonies. Being part of these ceremonies is very important to Métis because we have contributed to the defense of Canada as far back as the War of 1812 as well as both World Wars, the Korean Conflict, peacekeeping missions and most recently, Afghanistan. Over the years, many Métis have served and many have made the ultimate sacrifice. By making the Métis presence felt at Remembrance Day services, we show our respect for all Veterans and we remind all Canadians of Métis service and sacrifices. Since 2004, the Métis Nation of Ontario (MNO) has laid a wreath at the National War Memorial in Ottawa during National Remembrance Day ceremonies. 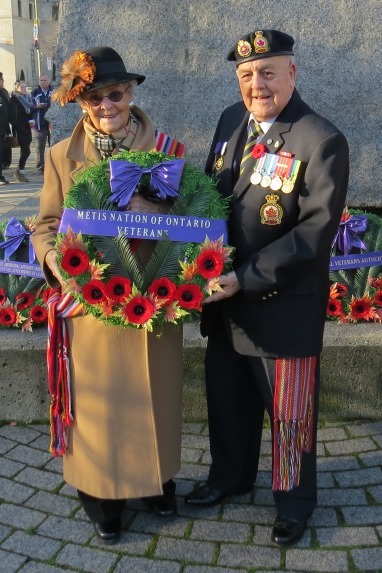 In most years, the wreath has been laid by MNO Executive Senator Reta Gordon and a Métis Veteran. This important gesture on behalf of all MNO citizens is performed in good weather and bad because it is important to recognize our many Métis Veterans who gave and continue to give so much in securing and sustaining the rights and freedoms that we all enjoy. Recent tragic events including those at the National War Memorial itself, reminded all of us that members of our Armed Forces put themselves in harm’s way every day to protect the lives and liberties of their fellow Canadians. This year Senator Reta was joined for the first time by Métis veteran Rene Roland Joseph Leonard C.D. Rene was born in 1929 in St. Boniface, Manitoba. A descendent of Louis Riel, Rene was always aware of his Métis identity and joined the Métis Nation of Ontario in 1993, the year the MNO was founded. He served in the Royal Canadian Engineers from 1951 to 1980, including tours in both Cyprus and Germany. 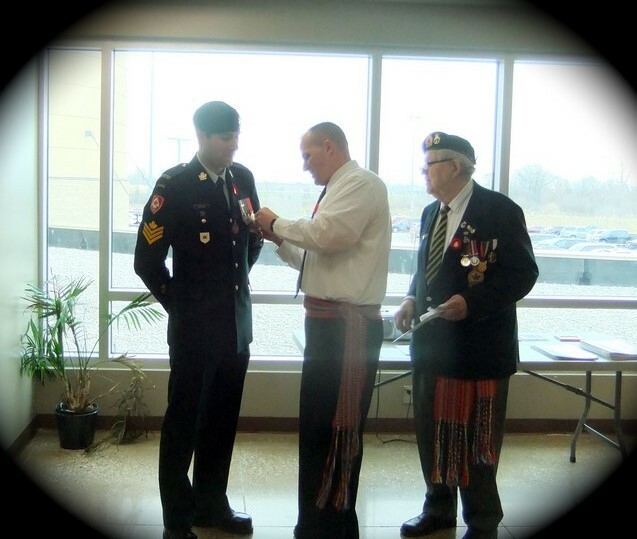 On November 5, 2014, Rene was presented with both the Louis Riel Medal and the Batoche Medal from the MNO Veterans Council. According to Rene’s daughter Catherine Vieau, he never thought in his wildest dreams that he would be asked to honour his ancestors and brothers and sisters, both past and present by representing the MNO at the National War Memorial. He considers it a privilege and was at a loss of words to express what it meant to him. On November 11, following protocol, Rene, as a veteran, presented the MNO wreath to Senator Reta who then laid the wreath on the Memorial. Senator Reta’s father and her nine uncles all participated in World War II. Then later in the 1950s, her four brothers also served in the military including MNO Senator George Kelly, who passed away in 2013. “It is good to let everyone know the Métis are here and that we support Remembrance Day,” explained Senator Reta. Laying the MNO Veterans Wreath this year will be Veteran Rene Leonard C.D.